Javaun's Ramblings | Media + technology and a healthy dose of mountain bikes. The weakest link in security is the human, and criminals are getting a lot better at the kind of phishing emails they send. They don’t have to crack systems, they can crack you by getting you to give up your credentials. Crooks have figured out that if they spend a little extra time proofreading emails and putting an official logo on them, it’s often enough get even intelligent users to click through to a fake page and give up passwords. Though not widely disclosed, the “hacks” of prominent news organizations websites and social media feeds by the Syrian Electronic Army were simply well-crafted phishing emails. 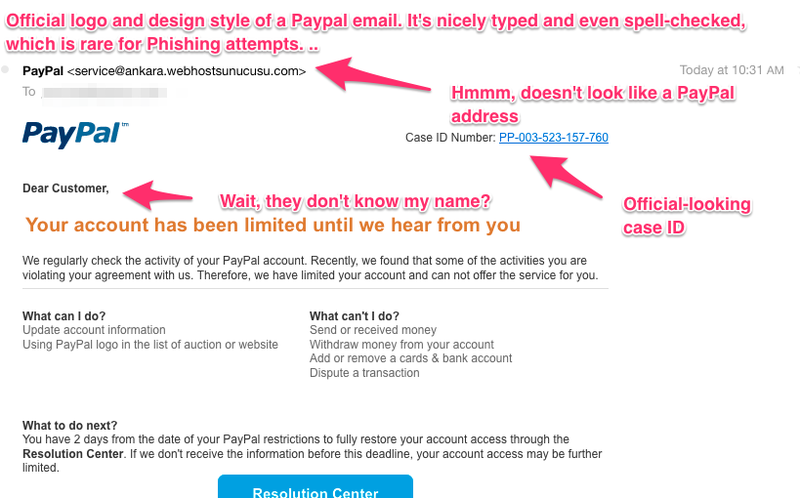 The malware filters on your email don’t always catch them. This one got through and someone actually took the time to make it look nice and proofread it. It could easily have come from your bank or other financial institution. I annotated it just to show what to look for. If any of your web services have 2 factor auth, you should set them up. Google and Yahoo! accounts (i.e. Gmail, Docs, Yahoo Mail), social networks (Facebook, Twitter, etc) have it. Sadly, your bank does not even though it would make it extremely difficult for a remote attacker to access your account. This entry was posted in Uncategorized on February 3, 2016 by Javaun. It’s been a busy summer (we had another kid! ), and I’ve been delinquent in posting decks from my latest talks. Alex Howard and I have been speaking a lot about the coming deluge of sensor data. Privacy concerns dominated our News Foo session, well before the Snowden NSA disclosures accelerated the conversation around data privacy. Alex wrote an exceptional follow-up piece for the O’Reilly Radar. We were also referenced by Harvard’s Nieman Lab. I hadn’t given a lightning talk in over a year and gave two in June. Columbia’s Tow Center is extremely innovative and forward-thinking. I was delighted to participate in their sensor journalism workshop and gave a short talk on getting started. Privacy was one of the main themes I stressed. The two biggest sensor journalism stories of the last six months were unintentional and had negative consequences for journalists and their sources. Vice magazine gave away John McAfee’s location, and the Tesla logs challenged a NY Times reporter’s memory. Before we wade into sensors, journalists need to have a conversation about privacy and ethics. What will be able to be subpoenaed? How do we avoid unintentionally hurting the people we’re trying to protect? Finally, I participated in a panel on digital innovation at the ASNE 2013 alongside my NPR colleague Brian Boyer. The Reynolds Journalism Institute mentioned our panel here and here. Videos: my talk on innovation outside the newsroom. Brian gave an phenomenal talk on the importance of building for mobile. This entry was posted in Uncategorized on September 15, 2013 by Javaun. March’s 30 Day challenge was to get my physical health in order. While I didn’t expect to train like I used to before I became a parent, I wanted to resume regular exercise. Even before I started, I doubted the likelihood of actually doing that, so I also added something more realistic and measurable: I repeated one of Matt Cutts’ experiments and gave up sugar for 30 days. I’m sorry to say that March was an overall failure. Aside from not eating sugar, March was likely my least healthy month of the past year. First, exercise. There were three big reasons I underperformed. 1. I didn’t define my plan. I started exercising and eating well on the first few days but quickly lost momentum, because I didn’t write down a weekly training plan, i.e. days spent riding, running, doing weights, or recovering. 2. I didn’t have an end goal. In the past, I usually had some specific date on a calendar: a race, a big group ride, or an active vacation. In my former childless days I trained year-round, not always with an event in mind, but with the expectation that I’d choose a few. Now my time is so scarce that I can’t accomplish anything — personal or professional — without a specific goal in mind. I usually have to give something else up. 3. It wasn’t realistic. I knew I was going to spend 8 days traveling to Austin. While I naively packed my running shoes and three sets of workout clothes, they never left my suitcase until I ran out of clean laundry. Honestly, I think my biggest disappointment is how predictable and predicted this outcome was. I’m not new to goal setting. It’s what I do for a living. I also spent years training for various sports. Cycling alone consumed almost a decade of my time and dictated much of my lifestyle: how often I trained, where I went for vacation, what I ate, and even who I spent my time with. I know what I need to stay motivated, and I know things don’t happen if I don’t envision my outcome. The last time I trained with any structure was 2008, which is a hugely unfair comparison given where I am in life now. March 2013 was the first time in a long time when I attempted to log how often (or how little) I exercise now. I commuted by bike on March 1 and didn’t do so again until March 29, the last weekday of the month. I did weights a few times. For the last 5 days in Austin, I stayed in a hotel that was 1.1 miles from downtown, and I did the roundtrip walk twice a day along the river path. I easily walked 5-6 miles a day during that time, which is a mitigating factor but not enough to compensate for everything else. I was mostly successful in giving up sugar, but still had over a dozen accidental transgressions, where I took a bite of something and had to put it down. It was astoundingly difficult to do, of course because of willpower, but mostly because sugar is in EVERYTHING. Obviously sweets were off limits. 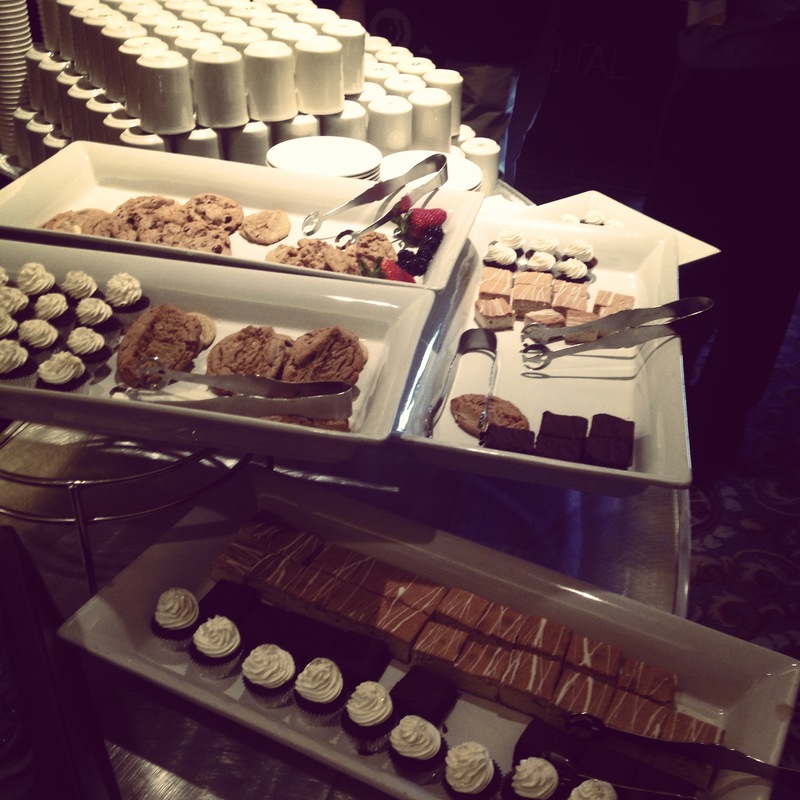 I took photos of all of the free desserts I passed up at formal meals, parties, and conference sessions. I couldn’t eat pie on Pi Day. I couldn’t try my neighbor’s chocolate chip and bacon pancakes at brunch. I couldn’t eat ice cream with my daughter, try my wife’s first loaf of banana bread, or eat red velvet cake at an NPR going away party. I went without chocolate for the longest period in my entire life. I didn’t even read labels, and I was still surprised at how much I couldn’t eat. I had a standing rule that if something tasted sweet and it wasn’t whole fruit, I couldn’t eat it. (I disallowed all artificial sweeteners as well). Ketchup and barbeque sauce I expected, but I had to put down sushi, salsa, and many other foods I wouldn’t have suspected. I didn’t even go near a Thai restaurant. A friend asked if I felt much better after giving up sugar of for a month, and I told him that everything else I did negated any gains. Beyond a lack of exercise in March, I spent the first few weeks sleeping very little and working and drinking too much. No doubt, it was a lot of fun, but it’s unsurprising that I was sick from March 16 through the 23 after being mostly healthy all fall and winter. I am disappointed by March, but I knew going in that wasn’t a realistic month to try a full physical makeover. I’m not sure I even wanted to do it. When I trained in the past, I would often take a few months off in late winter/early spring. DC was atypically dreary this March and that further sapped my motivation. Why did I even attempt it then? Wishful thinking? Perhaps trying to keep my streak from January and February alive? Or maybe I’m still burned out and wanting for that vacation I’ve needed for months. April and May are shaping up to be the most hectic months my wife and I have seen in years. We’re expecting kid number two this summer, work is hectic, and our landlord just told us he’s selling the house. Moving and nesting will be all I can do. One thing I loved about my January experiment was that I listened to a lot of music. It’s so soothing and I don’t do it often enough, so in April I’m listening to a different album, start to finish, each day. My biggest takeaway from March is a need to come to grips with the decisions I’ve made. My priorities have changed dramatically over the last five years. My work is mission-driven. My family is very important and I’m home for dinner every night. I invest all of my time there and in a few related projects. There’s little time for anything else. This is my choice, but I need to tweak the balance. For years, my wife and I spent every weekend in the mountains. While that old pre-kid life is gone, for years, she’s believed we’ve given up too much of it. It’s seventy degrees today in DC. I rode my bike to work and can’t help thinking she’s right. This entry was posted in 30 Days on April 9, 2013 by Javaun. January’s 30 Day Experiment was about drawing boundaries, living in the present, and giving my family my undivided attention. Eliminating distractions helped me really enjoy my interactions with people. So I decided to make my next experiment all about great conversations. For February, I called a friend or family member every day. This was a daunting commitment, but I was excited to get started. I made 31 calls. According to my call histories, the shortest was 3 minutes, and the longest was 77. I logged 3 days of in-person visits with family and friends from February 16-18. I didn’t keep time, so I conservatively estimated 60 minutes of conversation per day. I had 2 in-person meetings with old friends on February 21 and 22. Those were windows between work meetings and I did log them. After completing each conversation, I recorded the date, person, a brief note, and time in minutes into an Evernote doc on my phone. 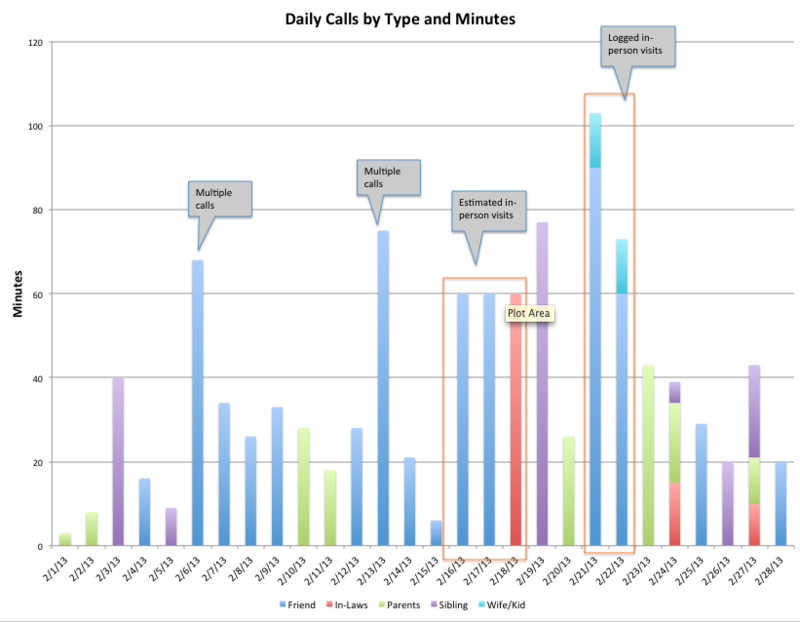 There were a few multiple call days. Here’s the raw data. I’ve removed the person I spoke with and the topic of our chat, since that’s private. But what did I really learn? I tweaked the rules a few times. First, I decided not to make calls on days when I was staying with family or friends, since I decided this would be against the spirit of the experiment. My goals was to have great, uninterrupted conversations, not make phone calls. You might think it would be difficult to set aside 20, 30, or even 60 minutes per day to catch up. It’s really not at all. The tough part was actually finding people to fill those slots. For the first few days, I’d go through my address book and serendipitously place calls. I quickly realized that I wasn’t likely to succeed without some planning. On February 5th, I went through Facebook contacts and dug deep into my address book that dates back to the late 1990s. I sent messages to 12 friends, laying out the experiment and asking for a 15 minute window. Here’s the note I sent. So, I’ll cut to the chase. I just want to find out how you’ve been and share family news. I’m doing a 30 day experiment where I’ve decided to catch up with a family member or old friend every day in February. Rather than just drop in haphazardly, I’d love to schedule something. 10 or 15 minutes is fine. I certainly have a lot of family news to share, I’m sure you do too. I’m pretty flexible during the day — lunch is free most days, and I’m usually free in the afternoon too. I’m usually knocked out 5:45 – 9pm EST with bedtime routine. If you have any time this week or next, drop me some times and I’ll make it work. These were all old and dear friends, but even I was surprised by the overwhelmingly positive response. It was basically a form letter, but it was honest and compelling: hey, I want to talk to you. Let’s not waste small talk on email. Let’s catch up now! My hope was 5 enthusiastic people, and maybe two booked slots. Within 24 hours, 11 of 12 had given me an enthusiastic yes and everyone wanted to talk within the next two days. One of my big takeaways is that there’s a huge potential for participation in experiments like this. My friends wanted to be part of my shared experience. There was a beautiful urgency too — only 30 days to be be involved. In most cases, we hadn’t spoken to each other in years. We weren’t going to let it go any longer. The chance to catch up, the time sensitivity, it was all as powerful and compelling as direct marketing, but it was purely in the spirit of sharing and joy. I want to keep thinking about this participatory aspect and how I can involve my friends more often. When you talk to someone regularly, you get to be involved in the daily aspects of their life. It’s obvious, I’d forgotten this, and rediscovered it accidentally while making a lot of late night “safety” calls to family to keep my streak alive. I learned about my brother’s new job, my sister’s dissertation, illnesses in the family, and I helped my mom make chili. These are the sort of random things you do when you see someone every week. It only takes a 5 minute call to stay up to date. It was really nice. I did more listening than talking for possibly the first time in my life. Partly intentional, partly by accident. One consequence of doing a lot of catch-up calls was that I often repeated details — I live here, work there, married, have kid — and hence became acutely aware of how much time I spent talking versus listening. By mid-month, I’d become a stellar listener. I’m sure it can’t possibly last. I caught up with my freshman year college roommate. We hadn’t spoken in almost seven years. I spoke with a high school friend I hadn’t spoken with in almost 20 years. I spoke with a college housemate I hadn’t seen in 3 years and my Atlanta housemate that I hadn’t seen in 5. Because of the calls, I was able to meet up with both of them in-person during a business trip to NYC. My siblings and I really talked at Christmas, and February gave us a chance to keep it going. We discussed what we believed were the most pivotal times of growing up and why our family turned out like it did. I spoke with a few new dads. One friend was recently engaged. Another newly pregnant. One friend left his company and is moving his family cross-country to start his own firm. I Skyped with my parents while reading bedtime stories to my daughter. I caught an old friend at JFK, as he was about to board an overseas flight. We stayed with old friends who recently moved to the mid-Atlantic and are new parents. We introduced them to another friend who has a child of similar age. This was a very demanding experiment, but also a very rewarding one. Having family in the Eastern, Central, and Pacific time zones gave me some flexibility to make early morning and late night calls. I can see myself repeating it once a year or so. In the meantime, there are a dozen or so folks I wasn’t able to connect with, and I’ll be reaching out to them before I lose my momentum. I grew my first-ever beard. How is that related to calls? It’s not. I was a few days into February when a boisterous conversation on beards erupted on a Google Group I follow. Not having shaved yet for the month, I decided that a beard would be my backup in case I couldn’t stick with calls. Like a friendship, beards take time to cultivate. 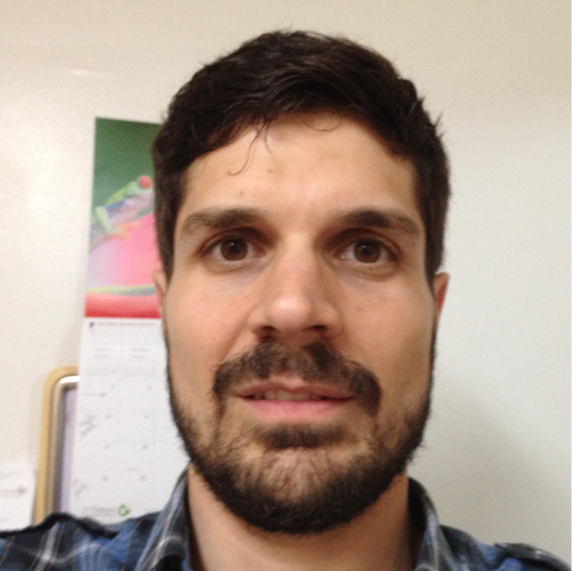 The best advice I heard when getting started was “Don’t shave.” BEHOLD! I’m completely hooked on 30 day challenges. They are, as Matt says, life-changing. 30 days is short enough to commit to something difficult and ambitious, but long enough to experience real self-discovery. Both in January and February, where I ended up was different than where I began. Both months have been full of wonderful surprises. So what’s next for March? I do want to build on the themes of changing the way I interact with people. January was reclaiming time and learning to “be there”. February was use that reclaimed time for deep conversations. After catching a glimpse of what it’s like to be a good listener and deliberate on my own words, I really wanted to try an experiment in introversion, with constraints on how much I communicate. The more pressing deficiency in my life, however, is my physical health and happiness. I used to be much more active and I ate better and slept more. So that’s March. I’ll see you back here in 30 days. This entry was posted in 30 Days, Family, GTD on March 7, 2013 by Javaun. I ended up working a lot over my winter vacation. I was already planning to implement Inbox Zero when I returned to the office on January 2, but one incident crystallized it for me. While I clacked away on my laptop on Christmas Eve night, my daughter walked up to me and said “I have a computer too”. She held up a small laptop she’d made with paper and crayon. It was both adorable and sad. I snapped a quick photo with my phone and *then* put away electronics for the evening. I decided to undertake a 30 Day Experiment for the month of January. I would restrict email checking to a few times a day and avoid all mobile phone usage while with my family. My goal was to “be there when I’m there” and enjoy myself. Our periodic Serendipity Day hackathon was starting on January 2, and I used that time to kickoff my experiment. Happy New Year! As part of a productivity experiment, I will only be checking email late morning and early afternoon. If you have an urgent matter, call me (gasp!) or walk over. I’m exceedingly lucky to be able to do something like this. I’m not the one they call at 4 AM when a server crashes. It’s a luxury. The next morning, I committed to not check email before 11. This was insanely difficult. 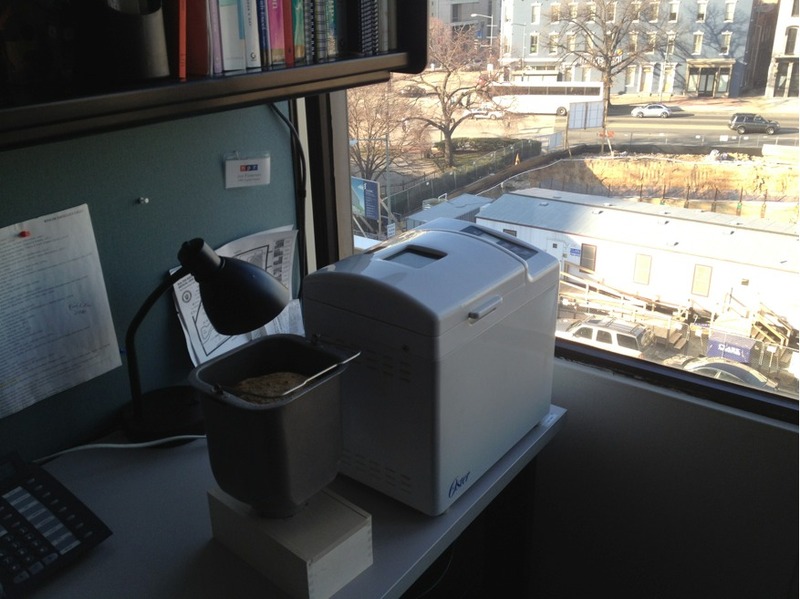 I met a friend for coffee, rolled in late, and then I baked a loaf of bread in my cubicle, because 1.) bread smells delicious, and 2.) I didn’t give up carbs. My first email check was 11:15 AM and I was ruthless: DELETE. DELETE. DELETE. DELETE. MOVE TO ACTIONS FOLDER… When I hit my stopping point I closed Mail and didn’t check it again for several hours, and that made my day lovely. I set an arbitrary cap of 30 minutes per email session, which I rarely exceed. Checking email was really intense for the first few days, but the sooner I got through it, the sooner I quit my email application and then the bliss set in. I challenged myself to unsubscribe to at least one email subscription a day for the first week. I close short emails with “Thanks!” or something similar so I’m not misinterpreted as a grouch. I use Mac Mail and iCal instead of Outlook, which means I can have my calendar open without having email open. I already had several inbox routing rules. I added more until things became manageable. Semi-related: I switched to a standing desk a few months ago and find it much easier to focus on single tasks. I also use Getting Things Done and Evernote to stay organized. Creating templates for commonly sent emails. Telling someone their email was too long and asking them to summarize it. In the past, I never let email stress me out, nor did I ever try to use it as a to-do list (that is a bad idea, by the way. ) I viewed email volume as something I had no control over, therefore I didn’t try. I now see that while email wasn’t stressing me out, I was wasting a ton of time re-reading messages. It wasn’t until I got my inbox under control that I realized how many important messages were falling through the cracks. I still haven’t hit Inbox Zero, I fell off the wagon a few times, but overall feel better and am more productive every day. 1/16/13, mark it. The day I broke my “twice a day” email/ inbox zero routine and became completely miserable as a result. Unplugging at home is much more difficult because it’s about a mental state. The technique I chose was prohibition: I kept my phone in my pocket, or on my desk in the charger. That’s it. I still zoned out and thought about work, though it was more difficult for my daughter to notice without my phone in my hand. Fake it until you make it. The email twice a day rule made it easier to not pick up my phone. Once the phone is out of the pocket for an email or weather check, it’s on to social media, and the death spiral begins. My social media interaction was so much lower this month that I’m sure I did miss some timely news and conversations — though I missed even more boondoggle time. I’ve had some really genuine, awesome moments with my family this month. We listen to music, make art, and have conversations. We play together at the playground while other parents are on their phone. I walk her to school or head to the grocery store without my phone. I’m very glad to have the capabilities of mobile Internet technology but also delighted to be able to walk away from it. I’m going to continue to tweak and refine my restricted work email and mobile abstinence experiments. They weren’t meant to end after 30 days. Over a dozen friends and colleagues reached out after seeing my away message. Many were already grappling with email. One had hired a personal productivity coach. We’re leaning on each other for ongoing support. I got a lot of free advice from Brian Fitzpatrick, Vanessa Fox, and all of the other attendees at an unconference session on unplugging. Many of my the ideas and tactics above came from that session or followup conversations. If you’re thinking about something similar, my advice is to start sooner than later. The 30 Day Experiment is a low-commitment way to jump in. Start with Matt Cutts’ three minute TED Talk below. Finally, my second 30 Day Experiment (28 days, really) is underway! I’m calling a family member or old friend every day in February. This is tough and it helps that most of my family is at least one time zone behind me. I’m excited to see where this one goes. I’ve heard a lot of great feedback on this post. I’m going to make the mobile moratorium around my family permanent. That was mentally difficult but I can sustain it. Limited email checks at work is more difficult. An aggressive goal works over a short period of time, but over the long run, it’ll only motivate me if I can hit it more often than not. There are days when two email checks isn’t feasible. Sometimes my most important tasks involve email correspondence. Sometimes task details are buried in an email. I try to mitigate those situations as best I can: stop the email thread and call a meeting. Or open up email quickly, grab the note I need, and shut it down immediately. In the case of January 16th (referenced in my tweet above), I spent half the day on email. That’s really, really rare. I often work after my family goes to sleep, and that can also mean an extra email check at night. Right now, two checks is working. I’ll continue as is and reevaluate each week. Inbox zero. First time ever. Email and mobile use both are intertwined, and both invade my mental space when I don’t clamp down. I’m glad I limited both at the same time. Matt did a far more ambitious unplugging experiment this month: 30 days without news or social media. 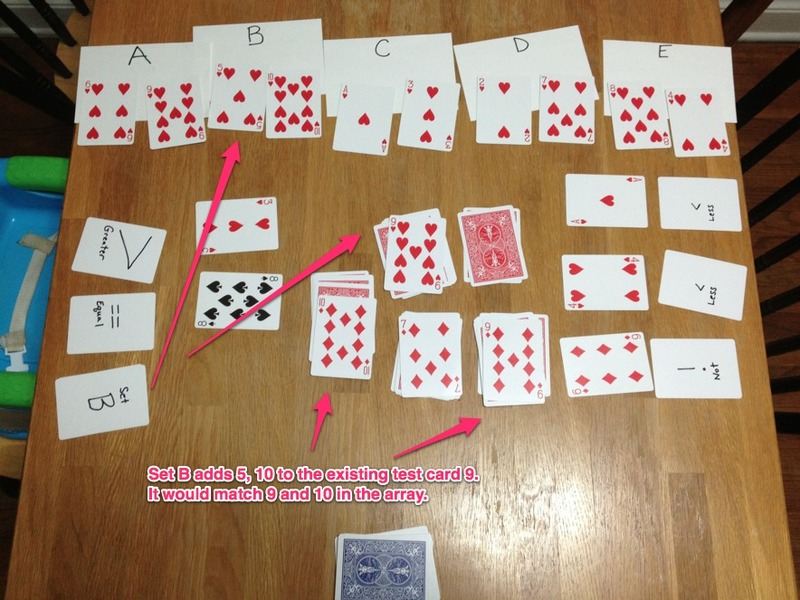 This entry was posted in Family, GTD on February 4, 2013 by Javaun. On Thursday I presented at the DC API meetup alongside Gray Brooks of GSA, Tim Herzog of the World Bank, Kin Lane of API Evangelist, and former White House Innovation Fellow Ben Balter. Our panel was moderated by Alex Howard of O’Reilly Media. Ben’s slide deck is here: all the code he referenced is open source. Kin Lane also did a writeup on API Evangelist. My talk was some high-level points we learned, sometimes the hard way. This entry was posted in APIs on February 2, 2013 by Javaun. ORD Camp is over. Now what? ORD Camp is quite simply my favorite event of the year. I mean that not only across tech and media events, but everything I do personally and professionally all year. At least 9 out of 10 attendees will tell you the same thing. Squids. Cephalopods, actually. Protostomes, really. We’re on a different evolutionary branch. ORD Camp is a Foo-inspired unconference, where the participants make the agenda. It is invite-only, FrieNDA, which leads to an incredible amount of intimacy and that makes the event so special. Since our time together is so short, sleep basically doesn’t happen. The super-achieving attendees include inventors, scientists, artists, chefs, teachers, civil servants, and technologists. To quote the hosts, you were invited because you’re either: “amazing, or crazy, or both.” We don’t all come from the same industry, and that’s a great thing because we all came to be exposed to new ideas and to each other. We’re all fascinated about being fascinated. saw Ignite talks on life, realizing childhood dreams, why automated trading isn’t evil, and how to fly a British airship. saw same Ignite slide decks abused, for our amusement, as part of Ignite Karaoke. learned I was a squid, came to be ok with that, and befriended eight other like-minded squids. For every amazing session I attended, I missed seven more. I met incredible new people and also some folks that I’d corresponded with online. We talked about our work, our passions, and our families. I had a terrific hallway conversation with a few Googlers as we took turns escaping from handcuffs. It sounds like a lot of fun doesn’t it? ORD Camp founders Brian Fitzpatrick and Zach Kaplan hold the event to “create more value than they capture”, using Tim O’Reilly’s shorthand for creating good for the sake of doing so and paying it forward. ORD Camp is an incredible gift. While the post-ORD Camp glow was ever-present on campers’ Twitter feeds yesterday, today the reality is setting in that it’s over. It’s special because the guest list changes every year, because there’s more than you can possibly absorb, and because of the uncertainty of your next meeting with these amazing folks. Fear not! I’ve learned this year that ORD Camp is not an event: it’s a community that just happens to culminate in the best event of the year. The ORD Camp community is trying to make the world more awesome, and Chicago is arguably the biggest beneficiary. Every city should be so lucky to have an ORD Camp, where city government, educators, entrepreneurs, non-profits, small business owners, technologists, and artists show up to talk about how to make their city more livable and prosperous. ORD Camp has spawned startups. This weekend there were sessions on city data, transit improvements, talks on history, and reviving Chicago manufacturing. I grew up in Chicago and despite not living there since 1996, I feel more connected than ever. Last summer’s hardware hackathon was only possible because of the ORD Camp community. While a move isn’t on the horizon, I am finding reasons to come back to Chicago throughout the year and interact with the community. Thanks so much to Groupon for hosting. Fitz and Zach, thanks for blowing my mind even more than you did last year. So what’s next? Keep in touch ORD Campers, and remember that if you pass through D.C., it’s a standing rule that I have to drop everything and meet you for a coffee/drink. 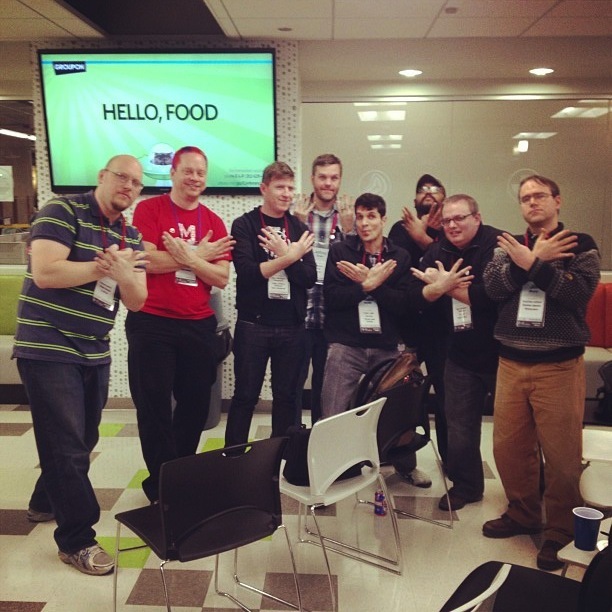 This entry was posted in ORDcamp, Technology on January 29, 2013 by Javaun. This weekend at ORD camp I led a session on map and compass orienteering. Even in the age of GPS, it’s an indispensable outdoor skill. Electronics break, fall in a creek, batteries die, or clouds blot out your satellite uplink. It’s also a ton of fun for participants of all ages, and it really connects you to hundreds of years of pathfinding. My toddler knows that the red needle on a compass points North, which is where Santa lives. The best way to learn is by doing. Map and compass fundamentals are the basis of the sport of orienteering — think: outdoor scavenger hunt — and Chicago even has it’s own orienteering club. For my session, I used the Silva Starter orienteering compass and a few USGS 7.5 minute quadrangle topographic maps. USGS quads are the basis of many commercial topo hiking maps and are available free of charge at USGS.gov. I owe a big thanks to Dennis McClendon of Chicago Cartographics for attending the session. As a professional cartographer, Dennis was able to provide all sorts of details on how maps are actually created. We primarily used maps of the ruggedly beautiful Blackbird Knob area of West Virginia, which includes portions of the Monongahela National Forest and Dolly Sods Wilderness. US Topo, 2011 (25 MB) – This was the primary map we used. The U.S. Topo map series is rendered digitally and includes many layer overlays and aerial photography that can be turned on/off when viewed in Acrobat Reader. 1995 Topo Map (13 MB) – The older maps are analog. While they may not be up to date, there’s something beautiful about them. They also contain detail on forested and cleared areas, trails, peak names, human-made structures and double track that the U.S. Topo maps lack. Of course, they’re also over 10 years old, so you may be looking for a clearing or a trail that no longer exists. Chicago Loop 1997 Topo – We didn’t get into the Chicago loop map, but I printed it in case we headed outside. You can practice biangulation (finding where you are by shooting bearings to known landmarks) from nearby Erie Park. While standing in the circle at the corner of Erie and Larrabee, I could biangulate using Willis Tower (Sears Tower as I and the map remember it) and Aon Tower (formerly Standard Oil). Or, if standing by the sculpture at the east end of the park, I could see the Hancock building and Merchandise Mart. map-compass-techniques: The session handout covered map contours and common navigation techniques. If you missed the session, this was the best free navigation tutorial I found. Orienteering – geared more towards the sport of orienteering than general navigation. Parallel errors – are you where you think you are? Following others – don’t do it! This entry was posted in Uncategorized on January 28, 2013 by Javaun. Last week I was thinking (procrastinating, really) about how kids in other countries start learning computer science and programming as early as six. Scratch is great, but my kid is still too young. I’m also trying to keep her away from screens for a few more years. 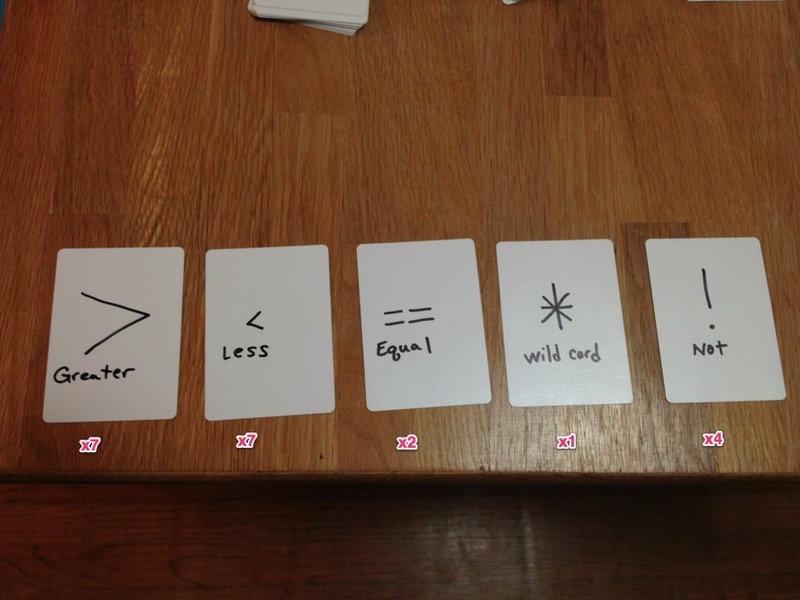 What I wanted was a basic card game like Memory that instead teaches basic boolean and set logic. I couldn’t find one, so I took a first pass at creating one. The goal: something easy and engaging enough for toddlers but with enough incremental complexity to entertain ages 7-10. I found it helpful to have different colored decks for the game play cards and the operation cards. The game is really quite simple. 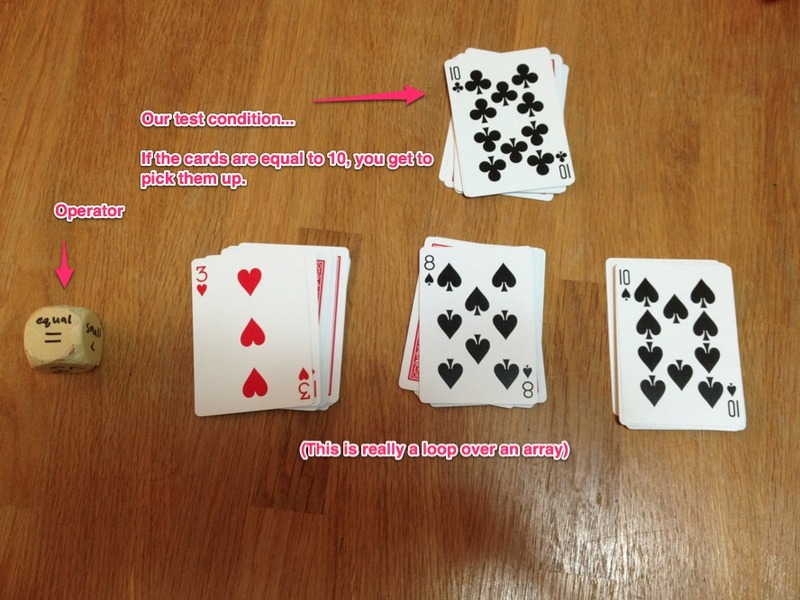 Using Ace – 10 in the standard deck, shuffle and deal cards face down into four equal piles. Ace is 1, all other cards are face value. Turn the top card up on each pile. The first pile is the “test card” pile, and it sits above the other piles. The last three piles sit in a row below the test condition and they’re the game play array. Test card pile, game play card array, and discard pile. Players take turns playing an “operation” with the test card and creating a test condition. The basic operations are > (greater than), < (less than), and equal (==). If the test card is 6 and the game play pile is 2, 3, and 8, playing < (less than) would mean “less than 6” and the player picks up 2 and 3. Game 1 Variation. Play until all three game play piles are gone. Whoever picked up the most cards wins. 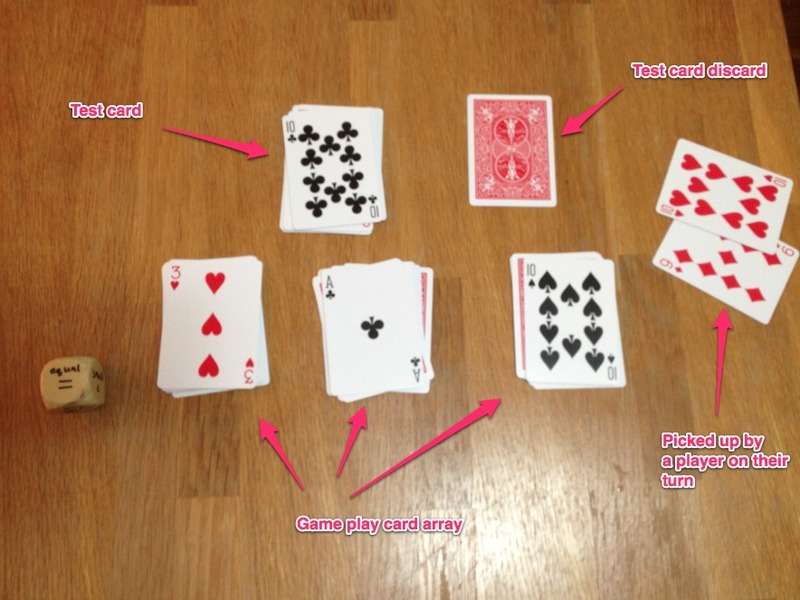 Game 2 Variation (more strategy): Players display the cards they pick up in a sequence Ace to 10. 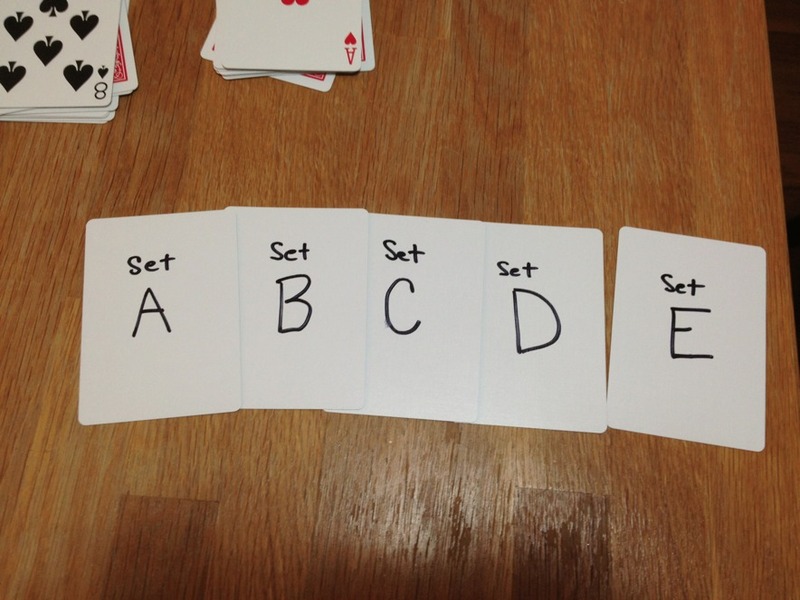 The first player to pick up all cards in the sequence A-10 (any combination of suits) wins. Multiples of any single card don’t count except to the extent they prevent your opponent from completing the sequence. Either version can be played solitaire or with two or more players. Ages 3-5 roll a die to choose their operation. I’ve used a die with two sides each for >, < and == and use the labels “BIG”, “small”, and equal or “same”. 10 clubs is our test. Our play cards are 3, 8, 10. Shhh… your kid is looping over an array. After graduating from the die roll, all players are dealt three operation cards at the beginning of the game. Players draw new operation cards at the end of their turn to replenish their hand to three. Once kids get comfortable with those three operations, I allow them to use == in tandem with > or <. If two cards are played, the player draws two more cards at the end of a turn.
! (not) is used in tandem with any other operation card and creates the opposite condition. Not > equates to <=, for example. It’s most powerful when combined with == to make != (not equal) to the test card value. 6 of spades is our test. 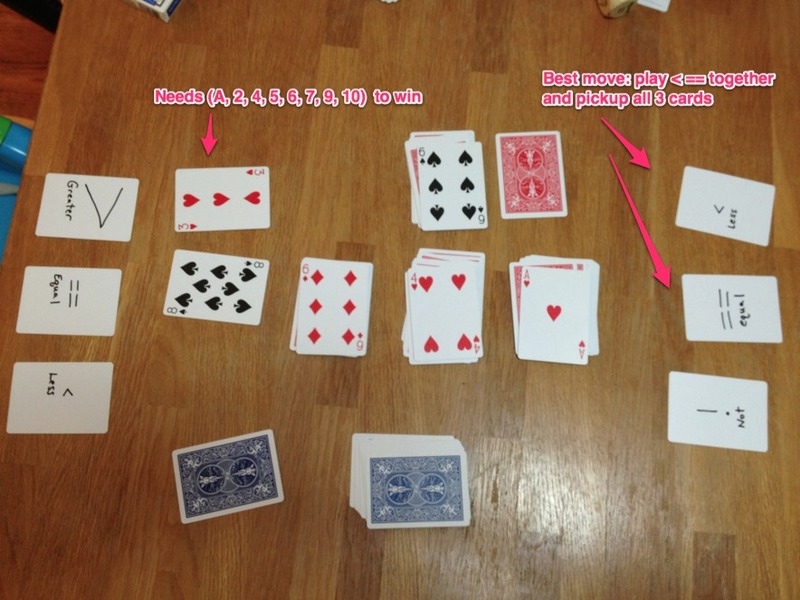 Player on the right should play < and == operation cards in tandem to pick up all three play cards. == (x2) used alone or in tandem with >, <, ! * (x1) wildcard. Can be any single basic operator: !, <, >, ==. Right now I’m only allowing two operation cards to be played at a time. This introduces basic set logic for added complexity. With the blank deck I created cards for set A, B, C, D, E. You’ll also need another standard deck with cards A – 10 in a single suit to populate our random sets. You can introduce from one to five sets into the game during the initial deal. For each set A-E, add those cards to the operation cards and shuffle. Next, create a line of expansion sets that sit above the test card pile. From the standard deck A-10 cards, deal out two cards at random for each expansion set. A set contains the two random cards it was dealt at the beginning of the game plus the value of the test card at the time at which the set card is played. In this case, the set contains 5 and 10 (initial values) plus the test card 9. If set B is played now, the player can pick up any game play cards that are in the set (5, 9, 10). Sets cards can also be played with ! (not) and any game play cards not in the set are picked up. If the test card is already contained in the set — too bad. Sets contain only distinct values. I’m thinking in the future that addition/subtraction(+/-), multiplication, and modulus division cards ( % 2) could be used to change the value of either the test or the gameplay cards. If the first player can successfully play an operation, they make their play and pick up whatever game play cards they earn. If they’ve picked up game play cards, the test card is turned down into the discard pile. A new test card is turned up and new game play cards are turned up wherever cards were picked up. Play proceeds to the left. Anytime a player can’t make a play, it skips to the next player and the test card is not discarded. (An option I’m playing with here: if you can’t make a play, you may discard one operations card face down and draw a new one.) Players discard operation cards after playing them and replenish their hand to three cards at the end of their turn. When the test pile or operation piles deplete, shuffle the discard pile for either and start fresh. Anyway, that’s my first draft, it’s still rough. The easiest iteration is definitely simple enough for a four year old, I’m more concerned that it’s not fun enough for… well, anyone. I welcome contributions. One caveat: if we’re doing this in the open, it’s open. Let’s say Creative Commons (or would that be GPL?) so don’t go calling Hasbro if we think of something clever. This entry was posted in Education, Family, Open Source and tagged Computer Science, Kids, Math on January 22, 2013 by Javaun.